There is a practical, proven way to surmount these challenges. It involves creating a shared identity for your virtual team. This article examines the latest research, introduces a vital new theoretical framework, and provides an example of an innovative enterprise solution. This article is based on a webinar the co-authors, Theresa Sigillito Hollema and Dr. Howard B. Esbin, presented in June 2018 to the members of “Virtual Team Talk” (https://virtualteamtalk.com). I wish I had a euro for every time I heard from a team leader of a virtual team ‘if the technology was better, we would be more effective’. Perhaps, but I think not. The other classic ‘everything will be fine when we meet’. Yes, meeting face to face has a big impact on working together, but given the limited travel budgets of most teams, can a team be effective in between the annual onsite meetings? The beauty of virtual teams is the necessity to return to the critical team elements which can be overshadowed in co-located teams by the charisma of the leader or the pressure to perform. By critical team elements, I mean the pure success characteristics in the essence of a team. One example is shared team identity. An example of the cognitive component would be the shared objectives, the team KPIs, the team charter, or other team agreements which we can rationally understand are shared by the team. The emotional component appeals to our need to belong with those who share common values and ways of being. We feel a certain level of comfort with those who have similar beliefs and views. Finally, the behavioral component includes practices that bind the team together, including behavior aligned with the team charter, or the team’s reaction to external feedback. For co-located teams, shared team identity often develops stealthily on its own. By arriving at the same office location, team members begin to have a shared environment and context, office desks, supplies, local holidays and work regulations. The team may even be sitting in the same office area, thereby providing a spatial visual to define the team. Co-located team members can easily build informal relationships with colleagues, which may include team events like lunch together, or drinks after work. In addition, the team leader can easily observe and interact with each team member individually, responding to their unique needs and motivating at the right moments. 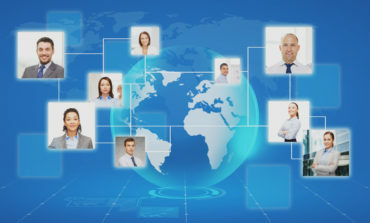 Most of these visual cues and emotional connections disappear in a virtual team and are replaced by technology and cultural differences, which tend to exacerbate psychological distance. A team needs a unifying energy, something which is implicit for a co-located team, but needs to be explicit and developed in a virtual team – shared team identity. Shared team identity minimizes conflict. When team members feel connected, they interpret behaviors of others more positively and informally reach out and communicate with team members to resolve misunderstandings or answer questions before they escalate. Team members identify with the team and engage in behaviours that prioritize the welfare of the team over other groups or their own self-interest. 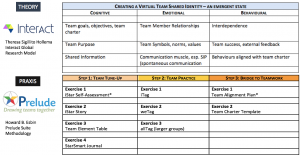 Shared team identity can bridge the fault lines, or the subgroups which can easily arise in virtual teams. Fault lines may be expressed by geography, culture, language, function, etc. and can worsen the psychological distance between team members. Through the process of creating a shared team identity, team members learn who knows what information, which increases the transactive memory of a team, thereby having a positive impact on team performance. A team’s shared identity can create a feeling of inclusion within the cultural diversity in the team by emphasizing the common values, norms and beliefs the team members share. In other words, if I feel connected to you and we are sharing information and common team norms, I am more willing to listen to your unique perspectives. Given the necessity for a shared team identity, what can the team leader and members do? Shared team identity is an emergent state in a team, which means the sense of oneness with the team emerges from various actions, attitudes, work set-up, communications, etc. With this in mind, the following chart is a guide of various focus areas to be considered by a team. In Part III, we examine how this new theory of emergent virtual team identity works in practice. More specifically, we examine how one new team was able to better understand and actualize their own emerging identity supported by a resource called the Prelude Suite™ (which Howard co-created). 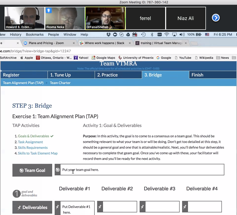 This is an online experiential learning platform designed expressly for virtual teams. An online facilitator guides teammates through a three-step process involving self-assessment, self-expression, co-creation, and dialogue. The goal is to help accelerate and strengthen team emotional intelligence, trust, and collaboration. As the diagram below illustrates, the theoretical model of emerging team identity, in its three facets, is mirrored by the three experiential learning modules of the resource. This software development team is cross-functional and cross-cultural in composition. There were nine team members. The team lead is Dr. Faisal Nasser Shehab. Dr. Shehab is an Enterprise Architect and Associate Professor as well author of “Emergent Leader Detection and Identification in A Virtual Team Environment: A Grounded Theory Study” (http://bit.ly/2y4PXlr). The team is building a “Virtual Team Business Management System” based on Dr. Shehab’s research. Their mission is to provide organizations with “the knowledge, the framework, and services required to implement a robust and a mature virtual team management capability”. 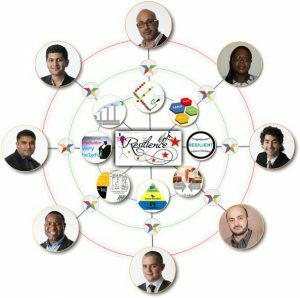 In April 2017, Dr. Shehab learned about a resource called the Prelude Suite™ that supposedly helps accelerate virtual team trust during formation. Aware of how disruptive and costly interpersonal challenges can be on distributed teams, he wanted his new team to start on the best possible note. After seeing the online demo and meeting the prospective resource facilitator, Dr. Shehab scheduled the Prelude Suite™ for the team. From mid to late August 2017. the team met together online for three sessions of about 90 minutes each. This process was guided by a trained facilitator. With each step, the team moved from a “me” to a “we” orientation. Throughout they used Self-Assessment, Self-Expression, Co-Creation, and Dialogue. Each step features a set of exercises, team-based and synchronous as well as individual and asynchronous. Everyone meets together virtually in a private online platform called a Sandbox using rich media (Video, VOIP, Chat, Interactive Whiteboard). The following outline the team’s step by step experience illustrated by screenshots from their three sessions. Prior to their first session, teammates completed an online self-assessment called iStar™. 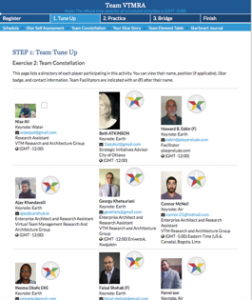 Their resulting iStar Badges are automatically uploaded to the Team Constellation page. During this session, everyone produced their individual iStar Story™. This is brief, holistic positive thumbnail quickly written and easily shared round robin. This is a rapid yet meaningful way to build new awareness and understanding of team diversity and shared strengths. They also reviewed their unique Team Elemental Table™. This reflects the team’s overall make-up in terms of a range of soft skills. Teams are able to quickly, easily understand where change may be needed. Teamnates also receive an individual digital StarSmart Journal™, which allows for ongoing personal and professional reflection, goal setting, and measuring progress. In their second online session, teammates practiced key soft skills together synchronously through a co-creation challenge using an online interactive whiteboard. First, they each create a personal iTag™ to symbolize their unique quintessential qualities and strengths. This combines words, symbols, colours in an overall design. Everyone then shares their tags with each other. In the second exercise the team as a whole is then given a challenge to co-create a powerful digital symbol of their team spirit and excellence called a weTag™. Creating pictures reveals connections and emotions that words alone may not. During these exercises, participants are literally and metaphorically drawing together to create ever-larger frames of understanding ending in their ‘big picture’ allTag. This helps them to see how they and their different strengths fit together in a very positive light. In their third and final session, teammates went through two exercises. The Team Alignment Plan™ enabled them to quickly, easily bridge their shared soft skill inventory with project work goals, tasks, and deliverables. This is final check for the team to assess if they have what they need to move back into operating mode. Their final team exercise produced a robust Team Charter reflecting the insights gained and lessons learned about themselves as a team. 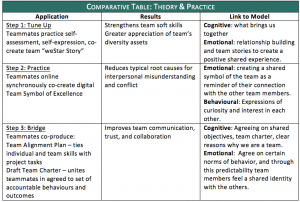 The following Table outlines key areas of alignment between the theoretical model of emergent virtual team identity with the Prelude Suite’s training method and benefits as illustrated by the case study. Team Goals, Objectives: Teams need a reason to exist, a clarity on what they are required to achieve together. Often virtual team leaders default to clarity of objectives, roles and responsibilities because these are the easiest to define when members are at a distance. However, these are only part of the story and we need to also retrieve the human element which disappears in the technology. Team Charter: A Team Charter is an agreement on what they team will do and how the team will work together. For instance, meeting times, decision making and information sharing processes, roles and responsibilities, etc. The contribution of a team charter is not only the content, but the conversations to come to agreement, as often team members have different expectations, especially if they are in different locations or countries. Shared Information: On this chart, shared information impacts shared team identity when everyone on the team believes they have access to the same information and have the same amount of information from the team leader and other team members. Virtual teams have the risk of different information/reporting systems, or team members co-located with the leader are better informed. Team Purpose: This is the essence of why the team exists and goes beyond measurements and annual objectives. Often team members resonate on an emotional level with the team purpose, especially if the team exists to have a positive impact on humanity. Team Relationships: Building connection between the team members is a substantial topic and is another chapter on its own. 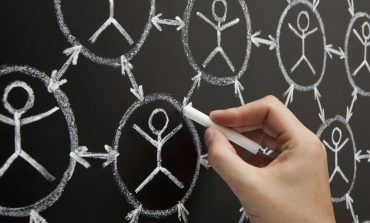 Essentially, when team members know and like each other, they feel a connection that feeds the emergence of shared team identity. Through informal conversations and online team building exercises, team members uncover common interests and build respect and appreciation for each other. Team Symbols, Norms and Values: Often sports teams are cited as examples of using team symbols as a means of uniting a team and fans. The visual has an emotional and psychological connection with other people who also share the logo, t-shirt, hat or mousepad. As visual cues such as a shared location are missing for virtual teams, shared logos and artifacts can have a valuable impact. However, these artefacts are the surface elements of a team culture. 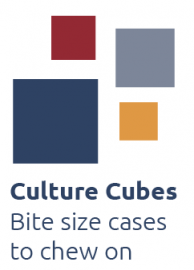 Deeper elements of the team culture (think of Edward Schien’s onion model are the shared norms and values, which are often examined in moments of dilemmas or crisis for a team, and are developed over time. Psychologically, people feel more comfortable on teams where they know the members share similar values. For instance, a team norm may be customer service. Behaviours of responding quickly to customer requests and flexibility to customer needs prove this value. However, if team members refuse to answer requests during non-work hours, or are flexible, until additional costs are incurred, then other values are clearly the priority. If team members agree, then the social identity is strengthened as they observe others acting in congruence with their own values. Communication Muscle, including Spontaneous Communication: Healthy communication between team members has the potential to break down barriers, stimulate idea sharing and reduce potential seeds of conflict. 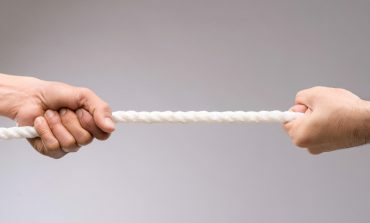 The link between spontaneous (informal) communication and shared team identity is one of strengthening intrateam connection and creating the lines of communication for when conflict arises. Specifically, studies by Hinds and Mortensen (2005) showed that team members who often had moments of informal communication found it easier to reach out to colleagues when misunderstandings occurred, thereby diffusing conflicts and reinforcing their shared commitments to the team and each other. A strengthened shared team identity emerged from these interactions. Interdependence: Often team tasks can be organized so that team members work independently, or interdependently, meaning they must work together. Interdependence contributes to the shared team identity by encouraging team members to learn about each other as people and their different locations. Equally important, the phenomenon of swift trust on virtual teams needs to be sustained by team members showing each other that they are capable, willing to share information, and available to support in a crisis. Through this type of collaboration, the trust that develops becomes a contribution to shared team identity. Team success/external feedback We need to remember that virtual teams do not operate in a vacuum but are part of a network where responses are given and received. Thinking in this light, one can easily imagine the impact on the sense of belonging when a team receives positive feedback from management, a customer, or other worthy stakeholder. Interestingly, negative feedback has the possibility, but not necessarily, of impacting shared team identity, depending on how it is perceived and digested by the team. For instance, the team may recognize the gap the feedback identifies could be addressed by interacting more as a team; or team members may align along the fault lines, use blame as the coping mechanism and broaden the distance. Naturally the leader and other key team members can play a role in how negative feedback fosters or dilutes shared team identity. Ashforth, B.E., and Mael, F. (1989), “Social Identity Theory and the Organization,” Academy of Management Review, 14, 20–39. Crisp, Brad C, Mortensen, Mark, and Wilson Jeanne, “Extending Construal-Level Theory to Distributed Groups: Understanding the Effects of Virtuality”. Articles in Advance May 23, 2012.